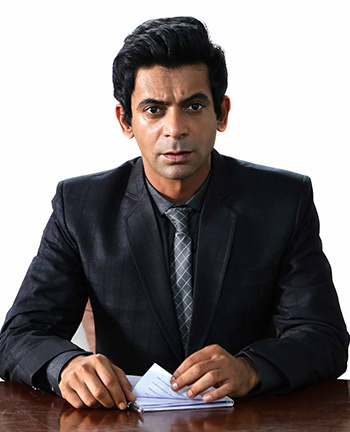 Rediff.com » Movies » Review: Sunil Grover's Coffee With D is avoidable! Review: Sunil Grover's Coffee With D is avoidable! Sunil Grover is good but it's Pankaj Tripathi who stands out with his bang-on comic timing, says Namrata Thakker. I remember watching the Hollywood political satire, The Interview, starring Seth Rogen and James Franco wherein the two manage to set up an interview with the North Korean leader, Kim-Jong-un. Though the film wasn't a big box office success, it was worth watching once courtesy its interesting storyline. Which is why I was looking forward to Vishal Mishra's Coffee With D, as the film treads a similar plot. Obviously, I wasn't expecting it to be spectacular but when you have a very talented stand-up comedian like Sunil Grover in the lead, you hope the film will tickle your funny bone. Sadly, that didn't happen. Coffee With D does have a few genuinely funny scenes, but that's about it. Arnab (Sunil Grover) is a prime time anchor with a news channel and is known for yelling at his guests and not letting them speak. Yes, I got that déjà vu feeling too! Soon enough, because of his behaviour, no notable personality wants to grace his show and he ends up getting demoted. Back home, he has a pregnant wife (Anjana Sukhani) to take care of. Dejected by his professional failure, Arnab comes up with an idea that he feels will help him win back his prime time show. He decides to live interview the most dreaded and wanted don, D (Zakir Hussain). Initially, Arnab's editor trashes the idea but, faced with the channel's falling TRPs, he comes around. Joining Arnab in this big mission is Neha (Dipannita Sharma), playing -- according to the film -- the best news writer in the country. When Arnab succeeds in grabbing D's attention with his stories, the latter agrees for the interview. The second half of the film is all about their one-on-one interaction. Do Arnab and his team get out of this encounter alive? Watch the film to find out. Coffee With D does not have a bad plot but it could do with a better on-screen translation. What lets down the film is the way it is executed and shot. The film's music and dubbing too are disappointing. Performance wise, Sunil Grover is good but it's Pankaj Tripathi (Nil Battey Sannata, Gangs Of Wasseypur) who stands out with his bang-on comic timing. He plays the dreaded don's sidekick and has the funniest lines in the film. Zakir Hussain is decent but the ladies in the film have hardly anything to offer. Dipannita's character is stereotypical and it seems the makers decided to cast her only to add some tadka to the film. There are a few more characters in the film but they fail to make any impression. If you have got absolutely nothing to do this weekend, you could consider watching this film. Honestly, though, I would prefer watching Sunil Grover on The Kapil Sharma Show instead.